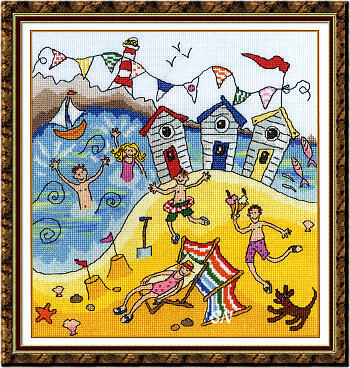 Adapted by Kate Hoyle, from Artist Amanda Loverseed's artwork, comes this eccentric, whimsical set of cut-away homes! Absolutely delightful in creativity, color, detail and subject, these four are the beginning of Silver Needle's collection of her designs! 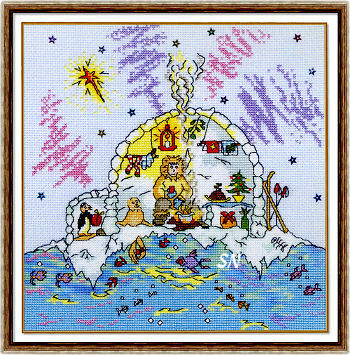 Offered as charts, each is charted for DMC flosses and is stitched entirely in regular cross stitches...with a few French Knots and lots of 'displaced' backstitch. Each package contains the master 'background' chart, as well as another that shows the backstitch relationships to everything else. It really makes the stitching of these a LOT easier... because the main chart isn't garbled up with all the extra stitching. So, so cute! Am I imagining things, so should some of these little bugs have pig tails in their hair??? 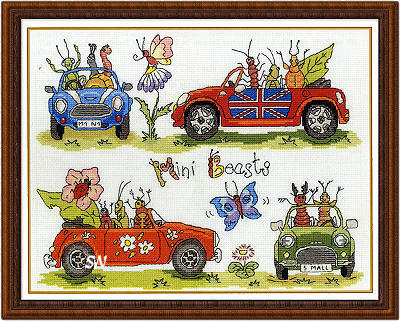 Stitch the whole row of bugs, watering cans, garden critters and all, or choose just a portion -- all of it is precious! Check out that hungry caterpillar on the end! 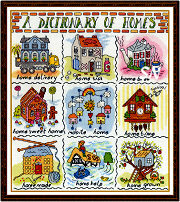 By June Armstrong, this is offered as the chart. The design measures approx 50 x 230-ish stitches, and can be worked on just about any fabric count you want! Check out the other recent arrivals by Bothy Threads... the Cut-Aways are always fun, and there is a new Noah's Ark Birth Announcement that is PERFECT for twins! Oh goodness -- stitch this for anyone who lives in or has visited Alaska!!! (in MY mind... 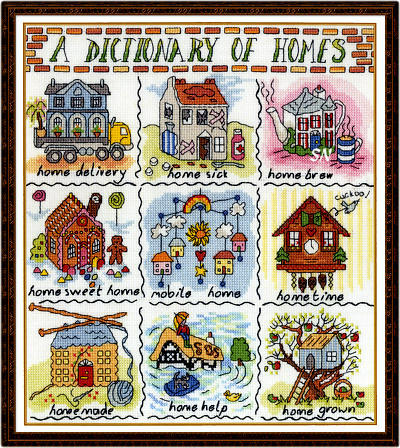 I see Alaska and Igloos... just like other people see Oklahoma with tee-pees and covered wagons or the *Surrey with the fringe on the top! * What a cute little abode... I think it's Christmastime! See the mistletoe and the good Christmas guest towels? The tree and plum pudding are on the table, presents beneath. The penguin is coming to the door with another gift, and I think the seal is still fishing for Christmas Dinner!!! Offered as a chart, this measures approx 120 x 130, and it comes with the overdyed blue-green floss you see in the water, and the opalescent purple and pink metallics for the Northern Lights in the sky!!! Rest of DMC flosses come from your stash. I can't tell who lives here... but it *might be* that little mouse nestled in the bed! 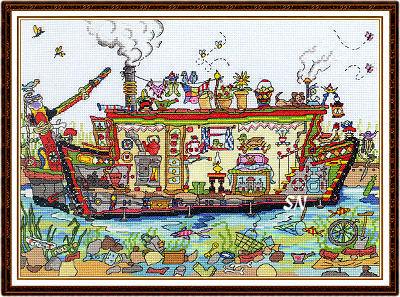 So much fun stuff to see in this house-boat piece... might be kind of fun to make for someone's floating home!!! or a fancy-schmancy yacht! There's even a titanic life preserver down there in the seaweed! Offered as a chart, it does come with some blue-greenish hand-dyed floss to dress up the water a bit, the rest of the chart is coded for DMC. Lots of stitching, but really, really eye-catching and Artzy-Fartzy-Fun! This is precious! You can stitch the entire row, or choose your favorites and place them beside the tree! Check out the tiny cat and mouse! THEY would make a darling ornament all by themselves! Offered as a chart, this DOES include white wool thread to stitch the fur trim on the fairies coats. There is a little nap raiser disc in it, too, so you can brush at your stitches and make the thread even more furry! Snowflake sequin embellishments included as well... these busy Christmas Fairies, dressed in bright red, just make me smile! Colorful charts that can be split apart into smaller designs, they're just for fun! 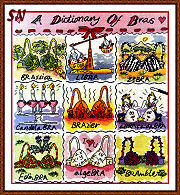 Scroll down to see at least 8 more Dictionary designs! 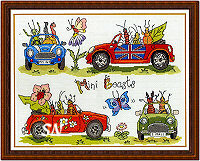 Another whimsical design that features colorful little cars driven and ridden by little Party-Bugs! Companions to Beetle Bugs, these are over-the-top cute! Stitch just one car for the new driver in your family... check out the Traffic Jam jar on the *Waspa! * Each little vehicle is cuter than the last... and all coded for DMC floss. Aren't these pretty??? So delicate, so cheerful! 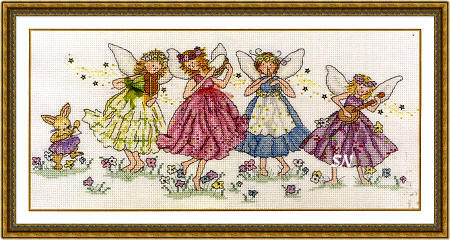 Musical Whispers (8 x 15) features fairies and a little bunny all playing musical instruments, dancing among the wildflowers. Offered as charts, and include a few tiny star sequin embellishments, as well as bits of the pastel yellow, blue, pink and green organza ribbons tied around their coordinating aprons and that baby bunny's tutu! All the wings include a bit of opalescent metallic as well... in there, too! I just love these... Precious! 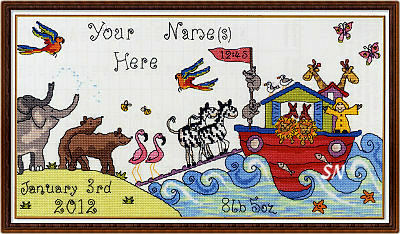 Darling birth sampler -- this measures about 230 x 120-ish in stitch count -- so about 16 x 8-1/2 in size. You could do it for twins! Can you see the varegation in the water color? The chart comes with lengths of green/aqua overdyed floss for that water! *Zebras and Algebras* this is a really cute piece that would be fun to stitch for a gal and her awesome dressing room, bath or closet! 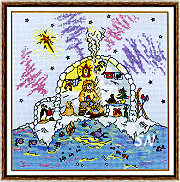 About 140 x 170 in stitch count... it's just silly! THIS is cute! 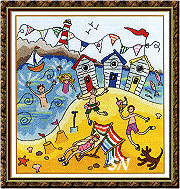 Super-colorful beach scene to stitch and hang in your lake house, or sunny bathroom... this stitches to be 10 x 10-ish, using DMC flosses. Just cute, I do notice that the symbol selection for the chart has a lot of the same 'value' ... you're going to need a highlighter to keep track of yourself on this chart. Very fun, very different, I love those little cabanas! Oh my gosh... if you love a little family member with 4 legs and some fur... maybe you can find them among these collections!!! Designed by June Armstrong, enjoy stitching the entire rows of kitties... or choose just your favorites, and re-name as needed! Offered as charts, but DO include white, grey and dark grey wool thread, as well as a little 'velcro' tabby thing, so that after you stitch the animals in the wool, you can brush the stitches a little, and make them FLUFF!! Finishes approx 15 x 4 on 28ct. Just too cute! We are treated to a medley of stitching/seamstress/knitter motifs... all packed into one sampling. Stitch the whole piece, or pull out your familiar stitching motifs and put THOSE into pincushions or whatever... each one is charming!!! 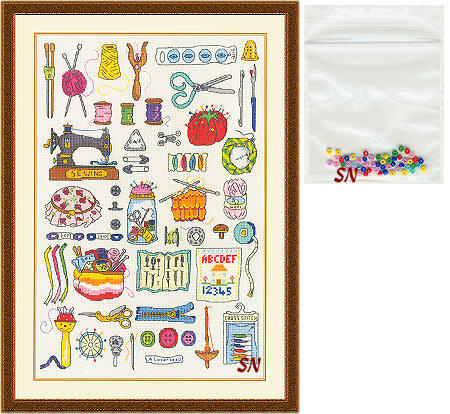 Offered as a chart with a little beadpack, this would be awesome on the door of your stitching room. But if you haven't got one of those... it'd be awesome *in part! * on the front of a sewing bag, too. Fun colors, relaxed stitches -- there are no half stitches in here... only 'relaxed' backstitches! Cheerful! 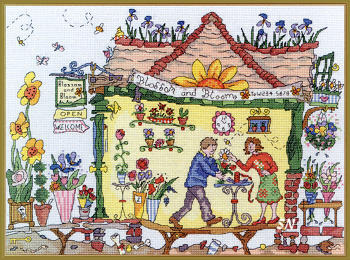 Here are more of Amanda Loverseed's fun cut-away designs of a happy little needlework shop, and florist! Always fun, you get to discover all sorts of hidden treasures inside, outside, and underneath the bustling scenes. We have 'buried treasure' outside -- scissors and pins. There's 'stuff' everywhere inside the shops -- notice the shop cat under the bench? 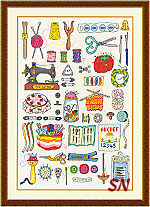 (and that needlework shopowner IS NOT me! I do have a skirt like that, but I don't wear red slippers to work!) Cute button jars everywhere, gorgeous pots and vases and the happy customers... just fun places! The florist shop is named Blossom and Bloom... I just love all it's color! Both are offered as charts and coded for DMC floss. 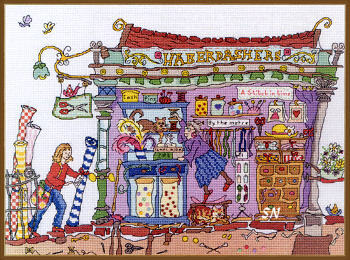 The Haberdashery chart includes some tiny buttons and beads to embellish all the jars. Each design finishes approx 9 x 12-1/2 on 32ct -- lots of stitching in these, but I think all the details make these so charming!